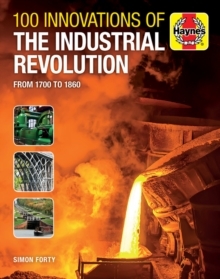 The Industrial Revolution changed our world in a way that few other periods have done: it changed the landscape with heavy industry, altered a national workforce, linked towns and cities with transport and communication networks and transformed the medical world. In utilising the plentiful supply of fossil fuels it pushed forward locomotion, light, manufacturing and food production to change human lifestyles forever, as urban life took over from rural. Regular wages brought freedom of information, travel and social mobility to many, and the world of 1800 looked vastly different to that of 1700 as the foundations for the modern age were laid. This book celebrates the major inventions and buildings of the period 1700-1860: a period when science and technology began to establish its role in modern life. Landmark innovations and inventions are put in context and explained in detail, from the first iron foundry in 1709 to the monumental Suez Canal in 1859. In between these dates come inventions large and small, including the flying shuttle, Ironbridge, vaccination, the Davy lamp, the hydraulic crane and the first transatlantic cable. Illustrated throughout and with informative and accessible text from author Simon Forty, this book charts a fascinating period of human history and endeavour, which still affects our lives today.